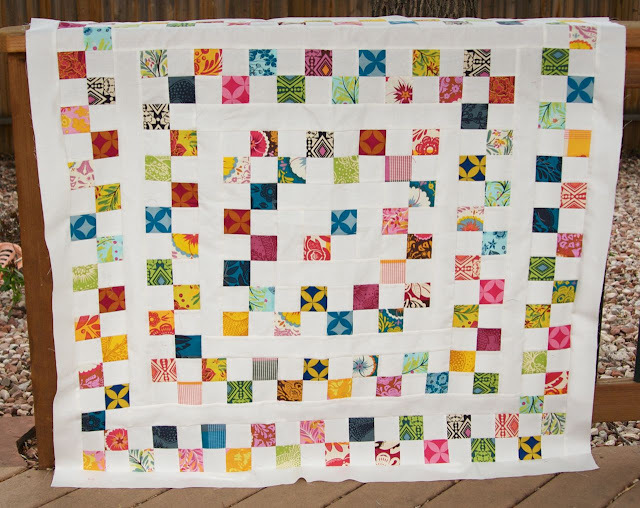 a quilt is nice: caught up! i am caught up on amandajean's quilt-along. phew! i really don't love falling behind. and now looking at this I see I messed up in the middle, bummer. oh well, there is no way i am fixing it, it's not that noticeable, right??? It's a beautiful quilt! I don't know what you "messed up" but I sure don't see it. Bravo!! I RARELY ever pick anything out, but I honestly would pick that out. I think it could be done pretty easily without very much seam ripping. You just have to take out that 4 patch in the middle. Before I read the post, I was trying to make sense of the quilt. It's still beautiful, even if you leave it, but for all the more work it would be, I would take it out and flip those two two-patches around. Sorry. My neighbor as I was growing up, made many quilts, and she always deliberately put at least one small piece in "wrong". It is beautiful the way it is, but in the long run if it is going to bother you forever, then see if you can fix it. I'm not a fan of picking out stitches, so I'm not really a good judge of that sort of thing. I think your quilt looks terrfic. Don't know what is wrong with the middle and don't care cause the beauty of the quilt is what I notice. It looks great, I love the bright colors that you used. (Don't tell amandajean but I like yours best so far!) The middle piece can be a design "feature" although as queenbee said, honestly I think it would be pretty easy to pick out just the middle piece and change the orientation. It looks fabulous! I'm not doing the quilt along and I can't tell that there's a misplaced block. Love your fabric for this! It gives your quilt personality :). I can't even see where you've messed up. This is going to be a gorgeous quilt! I like it too, just the way it is. I think it makes it more individual! Pretty fabrics, too. I can't find a messed up part. I think it is beautiful! Well I had to keep scrolling up to the picture to try to figure it out....I say leave it. The fabric is gorgeous. And besides, I'm so behind on this quilt-along, as in just the cutting out phase and just starting to sew phase. So bravo for you!! Gorgeous! Lot's of work went into that already! I can't tell how it's 'messed up'. It looks gorgeous! Love the colors. Your top looks great! Love your fabric choice. If the middle will bother you in the long run, fix it. It wouldn't take that much seam ripping and resewing to fix it, I don't think. Just the four patch in the middle. You'd just need to make sure put it back in exactly as before or you'll end up with a puckered middle. It doesn't have to be perfect. Sometimes the "mistakes" give it the most personality. I love it! I really like your center that way! It is still beautiful regardless of the middle. I don't see any mistakes...keep calm and carry on! when i first looked at it, i thought something´s not right here.. it took me some moment to find out what´s "wrong" with the top, then i saw it. it´s no biggie, but it would annoy me after some time, so i would change it. No worries! Only a quilter can see it, but who cares? It always adds interest to a quilt to have something "different" in it, I think. Good job! I wouldn't worry about taking it out, as quilters we are always too hard on ourselves. No one will ever know and I'm sure we wouldn't have even noticed if you hadn't told us! It's beautiful. I seriously don't see any mistakes. But now I want to know. I say leave it. It's fabulous. Such a nice and fresh top, and honestly I had to look hard before I noticed the 'messep up' part. If it bothers you now unpick, if not forget about it... the fabrics are so interesting. It's noticable, but in a good way! A fun bit of movement. If it really bothers you, you could always applique some squares on top. wow! I love the colourfull of your new work! I always find that the little mistakes that annoy me when I'm making something rarely annoy me after it's had some time to settle! A year after finishing something I barely notice the mistakes anymore and I certainly don't care about them! p.s- if you don't want to rip it, then don't change it just because the "quilt police" tell you to do it! It's going to live in your home after all! I love your quilt...you did a wonderful job! No it's not noticable at all...in fact I didn't notice until you pointed it out. I have a thing about mistakes....I rarely make anything with out some little glitch and that's what makes it special...unique. Like all of us! No other quilt like that one in the world. Nice job! Ohhh my. What a complete delight. It is beautiful. That is really beautiful.... love it. Doesn't Kaffe Fassett introduce something like that just to keep the eye interested ? gorgeous! I am so behind with the quilt along! It just makes your quilt more unique! I love it with the oops. I've heard about leaving imperfections in crafts as a nod to the maker and the hand. I always love when I find things that aren't quite right. the funny part is - I looked at your quilt and thought, I didn't realize the middle was that way - but I thought it looked right and interesting! So no, you don't need to fix it - It's awesome! Well that mistake took me a while to find, why not applique a big flower over the two blocks then no one would know.